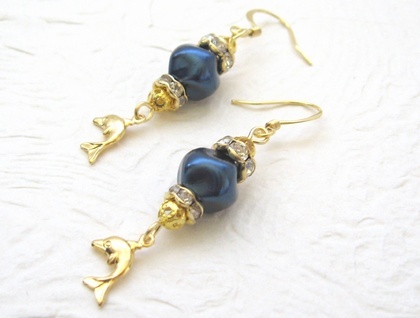 Deep blue Czech glass pearls, framed by gold-plated rhinestone rondelles and tiny gold-plated filigree balls. 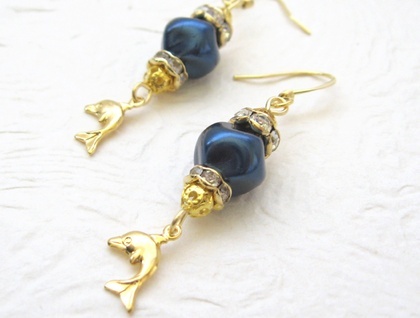 Beneath these stacks of gorgeousness hover little gold-plated dolphins. According to Plato, the legendary city-country of Atlantis was fabulously wealthy. An enormous Atlantean temple featured a gold statue of the sea god Poseidon, riding in his chariot pulled by winged horses, and surrounded by one hundred gold statues of Nereids (sea-nymphs) riding dolphins. Plato says that in a single day and night of destruction, Atlantis was obliterated and drowned, and all those magnificent sculptures were plunged to the bottom of the sea. 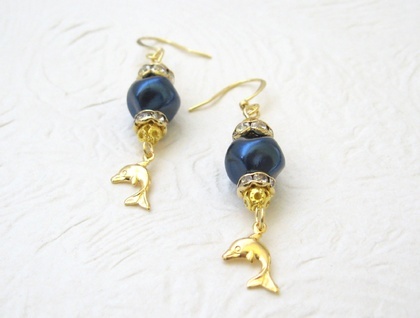 The little wee dolphins in these earrings will tremble as you move, full of their own vivacity. The faux pearls have indentations in their surfaces, to imitate freshwater pearls. The ear hooks are nickel free, so are suitable for most people with sensitive ears. 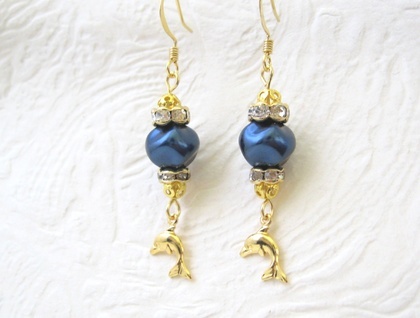 Aside from the glass pearls, all elements in these earrings are gold plated, resulting in wonderfully glamorous sparkle. The earrings measure 52mm from top to bottom. From the bottom of the ear hooks, the drops measure 36mm. The dolphins are 9mm wide.